"One of the most professional, warm, caring physicians. I highly recommend her." "Dr. Lyon is thorough, smart, and kind. The staff is very helpful and friendly." "I've been seeing Dr. Lyon for nearly 7 years. She's the best." "Dr. Lyon is fantastic. She is smart and knowledgeable. Highly recommend!" "I absolutely LOVE Dr. Lyon! She makes you feel as comfortable as possible." "Dr. Lyon is fantastic. She's been my GP and gyn since 1999. I recommend her to everyone." "Dr. Lyon is the absolute best. She is very personable." "Excellent General Practitioner. I highly recommend this practice." "Very professional. Always answers all questions and listens well." "Dr. Lyon made me relaxed and accepted. I felt open to talk about anything." "Efficient but kind. Thoughtful not judgmental. Easy to get an appointment. Great doctor." Our mission at Lyon Primary Care in Midtown, New York, NY, is to deliver reliable, wide-ranging, and patient-sensitive medical services to New Yorkers. 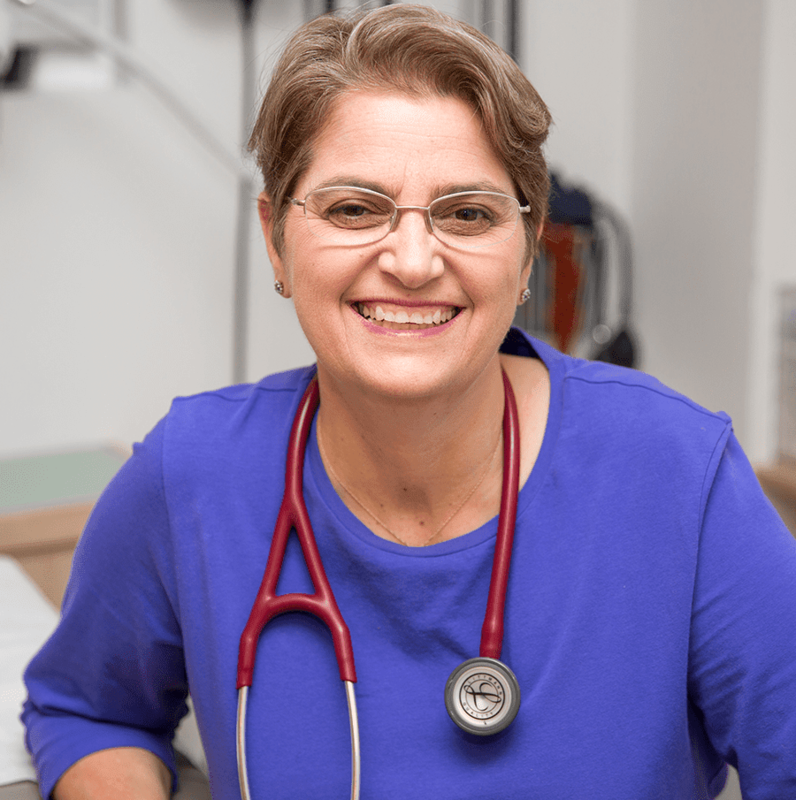 Every member of our team — which is led by board-certified family medicine specialist Valerie Lyon, M.D. — works to ensure you experience the quality health care you deserve. Dr. Lyon is a clinical instructor at NYU Langone Medical Center. As a primary care physician, she offers a wide range of comprehensive health services to our patients. You can rely on Dr. Lyon for everything from symptom management of your current common illnesses — such as colds and sore throats — to routine preventive health exams that may include gynecologic care with Pap smears, STD screenings, and oral contraceptive prescriptions. At Lyon Primary Care, we’re experienced at managing chronic medical issues such as back pain, eczema, insomnia, and migraine headaches — to name a few — and we design personalized treatment plans that effectively meet your unique needs. You can also depend on Dr. Lyon and our staff to help coordinate referrals to widely respected physicians in the city, if you require further care from a cardiologist, orthopedist, or other specialist. Whether you’re new to our office or one of our many long-established patients, our goal is to make you feel welcome in our office and throughout your experience at Lyon Primary Care. We listen carefully to your concerns and focus on building long-term relationships by delivering high-quality health care in a warm and inviting environment. "Never a long wait. Always professional and courteous. Thinks beyond your acute issue. I would recommend!" "Dependent, reliable and comforting place for my primary care as well as gynecology. Couldn't give enough praise to the staff, doctors, and PA's. Such an amazing office!" "Love Dr. Lyon. She has been my primary care physician for over 10 years. Very honest and up front. Never a long wait and the staff is always courteous." "The staff is friendly, and Dr. Lyon is engaging, non-judgmental, and straightforward. I'm seen promptly for annual physicals and I don't feel rushed." "Caring, professional and responsive. Office is pleasant in a central location, staff is excellent, appointments are on schedule and lab results are promptly sent." "Dr. Lyon has been my doctor for 9 years and she is excellent. No unnecessary tests, honest and straightforward, and extremely responsive." "I couldn't be happier with her and the practice. She is professional and very knowledgeable, but also friendly, caring and empathetic She makes me feel at ease." "Her staff is very efficient and polite. I always have a pleasant experience at this office and will continue coming back." "Dr. Lyon is wonderful! Great with returning phone calls same day and squeezing in emergency visits." "Dr. Lyon is caring, attentive, professional and extremely knowledgeable. I have recommended her to every friend in NYC who is looking for a new OBGYN or GP." "Excellent doctor. Puts you at complete ease and really listens and cares. Very grateful to Dr. Lyon." "Dr Lyon is fantastic. She is thorough and listens to concerns and answers questions without rushing you. She is also funny and I actually enjoy my visit with her!" "Great doctor. Dr. Lyons does not rush you out and takes time to really understand what's going on. She is knowledgeable and kind and I highly recommend." "Extremely efficient and well-run office. Dr. Lyon and her team are knowledgeable, very competent, great listeners, and never seem rushed. Truly patient-centered care."